First Night 2014: Fireworks at Boston Common at 7pm, Fireworks on Boston Harbor at 12am, Grand Procession Parade at 5:30pm, Ice Skating Spectacular at Boston Common Frog Pond at 6pm and much, much more fun events. All outdoor events are free, and indoor events require a first night button which is $10 a person. Allston Pudding Presents New Year’s Eve at Pizzeria Regina’s in Allston: Doors open at Pizzeria Regina’s at 9pm for $1 cheese pizza slices and $2 PBR and ‘gansett tallboys. Free cover. 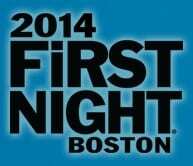 Figment First Night: Starts at 7:30pm at Boston Common on New Year’s Eve. Check out fun and free creative performances, fire performers, and more! The Average Joe NYE Party at Mass Ave Tavern: Starts at 7pm at Mass Ave Tavern in the Back Bay. The New Year’s Eve party for the Average Joe with no cover, casual attire, and a high life toast at midnight. New Year’s Eve at Bleacher Bar: Starts at 7pm at Bleacher Bar at Fenway. No cover, no tickets and enter to win Monster tickets to a Red Sox game! Also, some bars with no cover charges on New Year’s Eve: Pour House, Eastern Standard, Sólás, Bukowski Tavern, The Lower Depths Tap Room, Sonsie (link has music), Publick House, McGreevy’s, Russell House Tavern, and John Harvard’s. Thanks, BostonTweet. Also, the MBTA is free after 8pm on December 31, 2013 with extended hours! If you are traveling by car on New Year’s Eve, all 18 service plazas in Massachusetts will be serving free coffee from 10pm on 12/31/13 until 5am on 1/1/14! Also, on my Boston Visitor Guide tab I have some promo codes for Uber, Lyft, and Hailo on the list which may help with out in the near future! However, Uber already sent an e-mail warning users that surge pricing will be in effect on NYE, so you may want to use another transit source if possible or avoid peak hours. Hope you have a great New Year’s Eve!